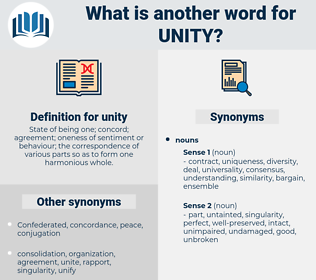 What is another word for unity? State of being one; concord; agreement; oneness of sentiment or behaviour; the correspondence of various parts so as to form one harmonious whole. Institutes, uniting, singularity, commonality, uni, communion, unifying, reunify. units, unification, reunification, solidarity, unified. 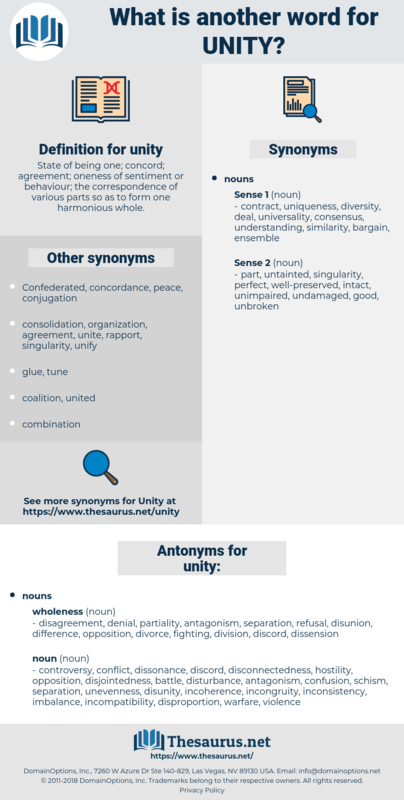 uniformity, unanimity, unification, cohesion, togetherness, uniqueness, consistency, cohesiveness, entity, reunification, oneness, unison, homogeneity, solidarity, re-unification, reconciliation. disagreement, difference, divorce, partiality, denial, fighting, refusal, division. controversy, conflict, dissonance, discord, disconnectedness, hostility, opposition, disjointedness, battle, disturbance, antagonism, confusion, schism, separation, unevenness, disunity, incoherence, incongruity, inconsistency, imbalance, incompatibility, disproportion, warfare, violence, variance, disorganization, asymmetry, discordance, disunion, contention, contest, irregularity, tension, dissension. Unity was the secret of power and prosperity. Unity came first in the imagination and the mind, next in literature and speech, and finally in political action.